Aloha Home Staging owner, Grace, has always had a keen sense of space and how design impacts our mood and spirit. Whether it was tidying the bedroom she shared with her sister as a little girl, making toss pillows for her dorm room, or refinishing a hand-me-down couch for her first apartment, she instinctively knew doing these things improved how the space looked and how she felt in the space. Service: Grace considers home staging as another way to serve others. Creativity and Eye for Detail: Her natural gift of creativity and eye for detail opens up a world of possibilities for your space. Order and Function: Order and function are integral parts of design and make your home more welcoming, attractive and marketable to potential buyers. Resourcefulness: Grace works wisely within your budget by using your existing furniture and home decor, whenever possible to achieve design goals. ORGANIZING – Provide decluttering tips and creative solutions for organizing your home. REAL ESTATE ENHANCEMENT – Get your home READY to list, STAND OUT to buyers and SELL quickly for top dollar. REDESIGN AND ROOM MAKEOVERS – Consultation with redesign planning, sourcing, and decorating. COLOR CONSULTATION – Assist in selecting color schemes for your space for a cohesive, pleasing look. VIRTUAL HOME STAGING CONSULTATION – Grace will meet and consult with you via email, Skype, or FaceTime using pictures you provide. “I called on Grace to help with a whole house renovation. From redesigning the layout to picking out fixtures, furnishings and paint color, Grace’s design ideas and eye for detail resulted in a beautiful home that I love and am very proud of. Now my home is a standout in the neighborhood and has greatly increased in value since the renovations.” – Janet M.
“I put my house on the market while I was working out of state. During my absence Grace made cosmetic changes to the home. She updated flooring, fixtures, painted rooms, sourced landscapers, and staged the home to attract buyers. My house sold within two weeks of listing with great profit in a declining real estate market. 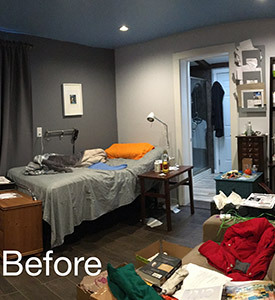 I attribute this success to Grace’s updating and staging the house.” – Robert P.
“After I moved into my daughter’s home, Aloha Home Staging helped us with space planning and organization as we combined households. I could not have imagined my room turning out the way that it has! Grace used her God given talents to transform our spaces into a welcoming, peaceful, and personalized environment. She was mindful to use our favorite furniture pieces and accessories into a design that met our individual needs and styles. Thank you and God Bless, Aloha Home Staging.” – Rufina B. 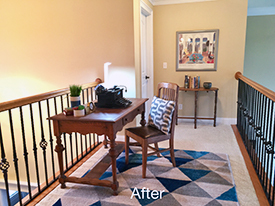 This empty second floor hallway was transformed into usable space by creating a small office area. 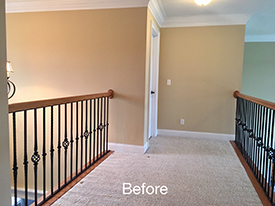 Grace used homeowner’s existing furniture and home decor from other rooms to create this inviting space. Furnishing this space helps potential buyers see possible use for this otherwise wasted, uninspired square footage of home. 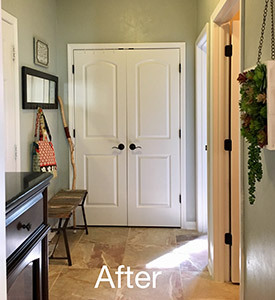 This mudroom’s heavily textured wall treatment made the room appear small, dark and dated. 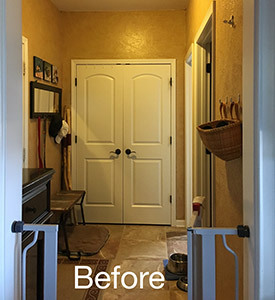 Smoothing the wall texture, repainting the walls and restyling the room by removing pet items and replacing wall art gives it an updated fresh look. This adds visual square footage and better welcomes potential buyers. 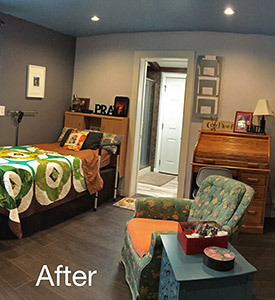 This makeover was for a great grandmother going through living transition, having to move into this room temporarily. Grace kept the access-friendly layout, removed bulky furniture and furnished the room with some of client’s treasured furniture and accessories to keep her surroundings comfortable and familiar. Removing side table and adding a headboard gave her handy bedside storage while allowing for easier access to bathroom. The added bedrail gives her extra stability when getting out of bed. Just a few changes made this room functional and cozy, meeting this sweet client’s needs and wishes for her space. 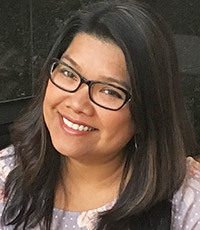 If your Illinois, California or Oregon house needs to be staged in the Mclean County, Bloomington, Normal, Le Roy, Heyworth, Hudson, San Francisco East Bay Area, Contra Costa County, Walnut Creek, Concord, Benton County, Linn County, Albanya and Corvalis, areas contact Grace Prigge today.